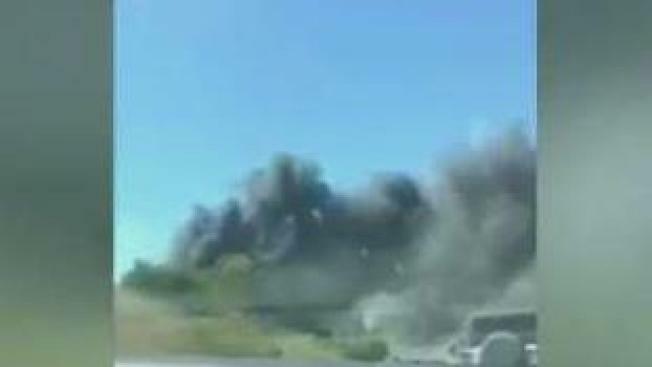 A big-rig fire on Highway 101 in Gilroy sparked a small grass fire Sunday and prompted a Sig-alert as all lanes of the freeway were shut down, officials said. The fire was reported about 3:35 p.m. in the southbound direction, south of Highway 25, according to the California Highway Patrol. Initially both southbound lanes were closed, but the CHP said all lanes had been shut down as of 5 p.m.
Traffic was being diverted to Highway 25, the CHP said. Both directions of 101 reopened just after 7 p.m.